Wes Cheek: "The Problem with the Problem with Nazi Analogies"
thanks to Wes Cheek for this great cross-post - THANKS WES! Godwin’s law tells us that internet conversations inevitably migrate towards Nazi analogies and therefore loose their usefulness. This may very well be true, but it presents me with a slight problem. How refreshing it is to get away from this atmosphere to surroundings where men give of their best without a thought, and give their lives too, without a murmur of complaint, while the leaders and those who should set an example quarrel and quibble about their own prestige, or haven’t the courage to speak their minds on a question which affects the lives of thousands of their fellow men. You can see our problem. This is obviously two Nazis having a conversation. It is also, obviously, very poignant. Beyond that, it is also, again obviously, relevant. One Nazi making an accurate observation to another Nazi that provides us with an insight that can be relevant to us today, is that something that we should pretend not to notice? Hitler’s big problem is that he was a genocidal maniac who exterminated people by the millions. He had lots of other problems. One of them pertained to his abilities as a military commander. As implied by von Stauffenberg’s letter above, Hitler had intimidated people away from commenting on his mistakes. Further, as can be evidenced in Beevor’s superb book, he was content only with yes men who would provide him with information that related to the reality he desired to believe. People who brought him the truth were quickly upbraided and filtered out. This factor played a great role in the disaster at Stalingrad. We, however, are not supposed to discuss this. You see, using names like Paulus and von Stauffenberg are too subtle. We can only say ‘Nazi’ and then think how wrong it is to think along those lines. What other military figures are we not allowed to discuss? Stalin? The name has a pretty big shadow over it, but people use it. Shaka Zulu? Kamehameha the Great? Sitting Bull? Vo Nguyen Giap? When someone presents their self as the military leader of a country, they deserve to be judged by those standards. One of the most influential and well documented figures in that coterie was Hitler. We can look at his record and analyze what was wrong. Now, it is obvious that the comparison being made in this piece is to Iraq. Does that mean to imply that President Bush would like to gas Jews? No, of course not. Does it insinuate that he might grow a mustache? Never. Is it possible he might do meth until he goes impotent? Possible, but irrelevant. Is it feasible that he would be so blinded by his own vision that he would discount the facts and surround himself with people who would do the same making the soldiers who served under him suffer needlessly? You make the call. I have a unifying theory about life here in Japan; when you treat people like children, they will act like children. That is just as true in the realm of American debate. We have internalized equivocation. We have traded accuracy for mediocrity because sometimes precision is scary. 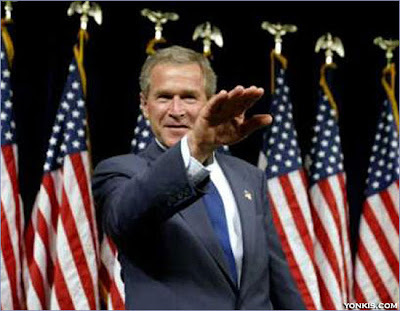 Is it immature to say ‘Bush is a Nazi’? Yes, of course it is. It is also stupid. But, it is more juvenile to write off history as context because we are afraid that someone will take our argument and simplify it. I read von Stauffenberg’s letter as an indictment of a hierarchy in thrall to their own self-importance. It was written by a Nazi, to a Nazi about Nazis and it is relevant to our discourse today. That is my problem with the problem with Nazi analogies.